Kath arrived yesterday [Thursday]. We were pretty tired so we just rented a film (Red Cliff) and relaxed. 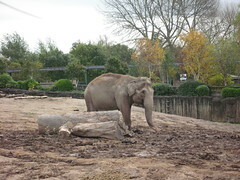 Friday we wanted to do something we ended up going to go to Chester Zoo. I haven't been since I was a really young kid so it was a bit of an adventure. I somehow got collared into paying an extra "donation" on the way in. Once inside we saw the elephant pen, then toured round the whole Zoo. Favorites included the Bat house, a dark dank place full of bats. I also loved the bears, especially the firefox and the Aquarium were all great.